Helps in Diabetes. Several studies have found that vinegar may help lower glucose levels: People with type 2 diabetes found that taking two tablespoons of apple cider vinegar before bed lowered glucose levels in the morning by 4%-6%. Lowers Blood pressure and improves heart health. Study has shown that people who ate oil and vinegar dressing on salads five to six times a week had lower rates of heart disease but its not proven completely. How to take Vinegar: Some people take two teaspoons a day (Always dilute it, either mix in a cup of water or juice.) A tablet of 285 milligrams is another common dosage. Here are some things to keep in mind before using!! 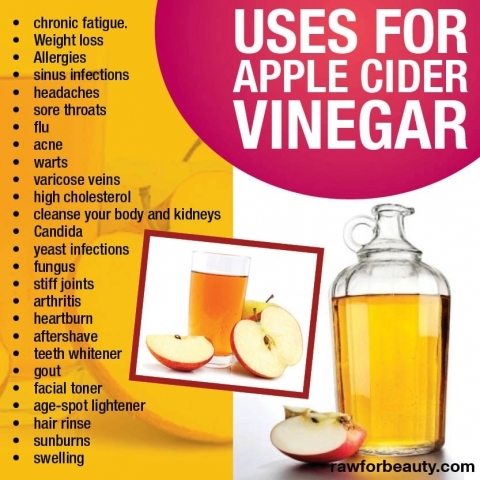 Apple cider vinegar is highly acidic. It should always be diluted with water or juice before swallowed. Pure apple cider vinegar could damage the tooth enamel and the tissues in your throat and mouth. Vinegar has been known to cause contact burns to the skin. Can interact with diuretics, laxatives, and medicines for diabetes and heart disease. Check with your doctor if you have diabetes: Vinegar contains chromium, which can alter your insulin levels. 2 ways to reap the benefits of ACV for your skin: by taking it internally or applying it topically. Topically, you can apply ACV diluted with water to tone your skin, reduce blemishes and promote a more balanced complexion. Because it can be harsh for sensitive skin, start by diluting ACV with water at a 1:4 ratio. You can increase the water by a quarter every week as your skin adjusts. Here are some health benefits of Cider Vinegar which you can try at home for some ailments; however, always remember to consult with doctor esp. if you have diabetes. Some uses have been tried by people and found effective but as always there is no guarantee about anything....one can try this for short while to see if it works but never for long term use.